Twitter is giving everyone 280 characters. It's the right move. Everyone will have 280. Here’s why it’s the right move. Before today, only a small fraction of Twitter users could send tweets longer than this sentence, which checks in at exactly 140 characters. 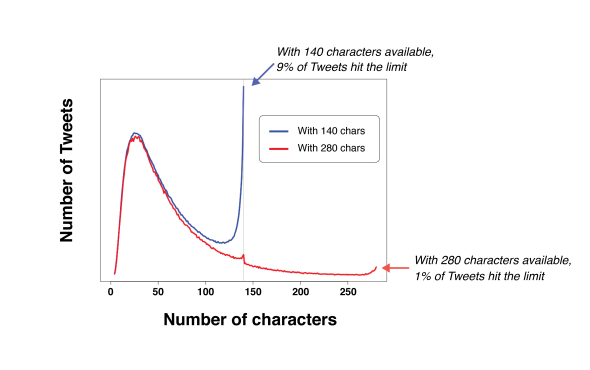 Starting now, however, Twitter is raising the character limit for all users in most languages (not including Japanese, Korean, and Chinese) to 280 characters. That means you’ll be able to send tweets that are precisely the length of this paragraph. A little wordy, right? In loosening the character constraint that has long defined it, Twitter risks sacrificing part of what makes it unique. In a time of information overload, the platform’s enforced brevity forced users to get right to the point. Some writers joked that the 140-character limit was the best editor they’d ever had. But the company makes a persuasive case that the change is for the best. In short: People like it. It led to fewer people bumping up against the character limit. It boosted user engagement and satisfaction. It did not lead to substantially longer tweets overall. The first finding should not come as much of a surprise. With more characters to play with, users were more often able to say what they wanted to say without having to edit. The result is that people spend less time fiddling with wording—who really enjoys the process of replacing words with shorter synonyms or stripping them of their vowels?—and more time just saying what they have to say. It’s great that some writers found the constraint useful, but the average social media user doesn’t want to be Emily Dickinson or E.E. Cummings. If that finding holds up, it could give Twitter something positive to report the next time quarterly earnings roll around. That could be partly because we’ve already been conditioned to keep tweets brief. It’s conceivable that, over time, the ethic of brevity will erode, and tweets will sprawl in length. That might be bad. But for a company that has been trying for years to broaden its appeal without much success, it’s a risk worth taking.